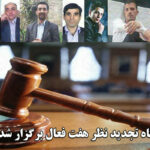 Human Rights Activists News Agency (HRANA) – On Saturday, September 1, 2018, Branch 3 of the Appeals Court of the East Azerbaijan province convened to review the cases of seven Azerbaijani activists. Judge Alizadeh will preside over the appeals process. Four of the activists – Akbar Aboulzadeh, Hamid Allahverdipour, Morteza Shokri, and Esrafil Fathollahzadeh – were present during the proceedings. The three others who were convicted – Saleh Molla Abbasi, Soleiman Kazemi, and Ebrahim Noori (detained in Tehran’s Evin Prison) – did not attend the court session. The activists were arrested for their participation in public protests against the state-sponsored television series Fitileh in November 2015. Parts of the TV program were believed to contain material portraying Iran’s Azerbaijani ethnic minority in a derogatory light. In October 2017 they were sentenced to prison time in a four-page verdict issued by Branch 1 of the Revolutionary Court of Ahar (a city in northwestern Iran), on charges of “Assembly and collusion against national security through propagating against the regime”. 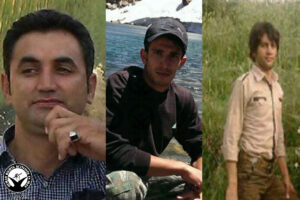 Saleh Molla Abbasi, Akbar Aboulzadeh, and Ebrahim Noori were each sentenced to ten months imprisonment, while Esrafil Fathollahzadeh, Hamid Allahverdipour, Morteza Shokri, and Soleiman Kazemi, were each sentenced to seven months imprisonment. The Fitileh protests reportedly involved around 25 participants. While the rest of the participants were eventually acquitted, these seven were convicted and now await the result of their appeals. 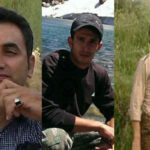 Human Rights Activists News Agency (HRANA) – On August 5, 2018, Branch 11 of the Appeals Court of Ardabil reached a verdict on the cases of three Azerbaijani activists, calling for fines of 21 million rials each (approximately $500 USD each), 70 lashes, and a four-month suspended imprisonment sentence. On charges of “disturbing the public peace,” activists Baytullah Barzegar, Sina Ghorbani Irshadi, and Siyamak Ghardashi were issued their original verdict on January 30, 2018, from Branch 101 of the No. 2 Criminal Court of Meshginshahr. Branch 11 of the Appeals Court of Ardabil rejected the activists’ initial three requests for appeal, remaining firm on their sentence of three million rials (with the threat of 70 lashes for recidivism) and 18 million rials (with the threat of 4 months’ imprisonment for recidivism). Per the original verdict, their sentence was to be suspended for a probationary period of 3 years. Last July, HRANA covered Baytullah Barzegar’s defense proceedings, as well as those of other activists arrested in conjunction with a demonstration held on International Mother Language Day. Barzegar has been taken into police custody on multiple occasions, including a 2015 Meshginshahr imprisonment for his participation in public protests against the state-sponsored television series Fitileh, which was widely believed to portray Azerbaijani peoples in a derogatory light.